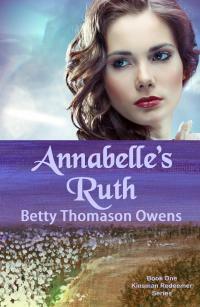 Today, I am very pleased to welcome Connie Cross, the heroine of Annabelle’s Ruth by Betty Thomason Owens. Having just finished reading the novel myself, I have only the highest praise for the story, the author’s writing style, the characterization, and the message. After their husbands perish in a fishing boat accident, Connie Cross determines to follow her mother-in-law, Annabelle, from Southern California to Tennessee. Her misgivings begin as they cross the bridge over the muddy Mississippi River. In their new town, where living conditions are far below their previous expectations, they must set up a household and hunt for work to survive. Thanks to the kindness of Annabelle’s handsome, young cousin, life begins to settle down. But Connie has a secret that could uproot them once again. Inspired by the Book of Ruth, Annabelle’s Ruth is a 1950’s era “Ruth” story, set in western Tennessee. How will Connie adapt to her new life amid the cotton farms, racial tension, and culture shock? Connie, please tell us a little about your life growing up in Maui. What is your fondest childhood memory? What would you rather forget about your childhood? Oh my. Life on Maui. It is surely one of the most beautiful places on earth. Where the wind always blows. It’s very green. Black earth—blue ocean—do I sound like an artist now? After World War II ended, Dad retired from the Navy. He bought a farm near a small village in the area of Makawao. It had once been part of a sugar plantation. He put us to work in the fields. He did his best to train the laziness out of us. I would rather forget those days. But the hardships I faced made me who I am today, so I can’t despise them. In many ways, I had a rather idyllic childhood. While he was still in the Navy, Dad was away much of the time. My mother was never a very energetic person. At the age of five, I was already looking after two baby sisters. We played outside most of the day unless it was raining. My fondest memories are actually from that time. Mom’s people worshiped nature. She would wander out at night and sing and dance in the moonlight. She said this would give her good fortune. Sometimes, my sisters and I would join her. We’d sing at the top of our lungs and dance until we dropped. How did you meet Joseph? Was it “love at first sight?” After high school I moved to Kahului. I found a summer job in a local movie theater to earn money for my trip to the mainland, where I hoped to attend college. The theater was a popular spot for sailors to hang out on a Friday night. One night, a slightly inebriated sailor made a pass at me, which I ignored. He became angry at me, actually pinning me against a wall. Another sailor came to my rescue. He towered over the perpetrator, ordering him to leave the premises or be reported, or something like that. Joseph was my rescuer, and yes, it was love at first sight. What trait do you find most admirable in others? Several come to mind, like honesty and integrity, but I think the most important one is love, as Paul taught in 1 Corinthians 13. Do you prefer cross-stitch and quilting or tending a garden? Why? Tending a garden. Because I love the smell of freshly-turned soil. I love planting seeds and watching them grow. But most of all, I love to harvest the fruit and vegetables and then eat them. Connie, is there anything you’d like to tell us about yourself? I’m not really fond of talking about myself. I’m glad you can’t see me blushing right now! Who I am today—the woman I’ve become—is because of the love of a very special woman. Annabelle Cross took me under her wing. She led me to Christ, but she didn’t stop there. She showed me by example, how to live, and how to be a godly woman. This is why I stayed with her. And God has blessed both of us, healed our broken hearts, and filled us up again. Betty Thomason Owens writes romantic comedy, historical fiction, and fantasy-adventure. She has contributed hundreds of articles and interviews to various blogs around the Internet and is an active member of American Christian Fiction Writers (ACFW), where she leads a critique group. She’s also a mentor, assisting other writers. She is a co-founder of a blog dedicated to inspiring writers, and a contributing editor for the online magazine, Imaginate. Annabelle’s Ruth is the first novel in the Kinsman Redeemer Series for Write Integrity Press. Her 20’s era romance, Amelia’s Legacy, Book 1, Legacy Series, released October, 2014 (also Write Integrity Press). She writes contemporary stories as a co-author of A Dozen Apologies and its sequels, The Love Boat Bachelor and Unlikely Merger, (2015). She has two fantasy-adventure novels, The Lady of the Haven and A Gathering of Eagles, in a second edition published by Sign of the Whale BooksTM, an imprint of Olivia Kimbrell PressTM. You are currently browsing the Ramblings of a Crowded Mind blog archives for June, 2015.